On the evening of October 12th, I had the privilege of reviewing final SAP Predictive Analytics presentations at the University of Notre Dame with guests from the City of South Bend. This was the culmination of the joint curriculum project for Notre Dame’s ESTEEM (Engineering, Science & Technology Entrepreneurship Excellence Masters) program which began earlier this semester. The original story about this collaboration can be seen here: Kicking Off Fall Semester Student Projects at the University of Notre Dame. The ESTEEM program participants all take a required course Data Analytics 101 for graduate students led by Robert Lewandowski. This course is a graduate level version of the SAP Predictive Analytics undergraduate course also taught at Notre Dame. We were pleased to welcome Santiago Garces, Chief Innovation Officer of the City of South Bend and his colleague Brian Donoghue to the course to kick off the special data set challenge they provided for students earlier this semester. The City of South Bend provided financial data sets for analysis this semester that are drawn from its innovative open data portal (http://data.southbend.opendata.arcgis.com/). Students used SAP technology to develop insights about the city expenditures and budgets and present findings back to city officials last week. ESTEEM is an innovative 11-month entrepreneurship master’s program designed to equip a person with the specific skills required to launch a business. Unlike the traditional M.B.A., an entrepreneurship master’s focuses on the direct application of business skills to an entrepreneurial environment. ESTEEM sets itself apart from other entrepreneur master’s programs by putting students in the middle of real-time startup development. In addition, a wide network of investors and alumni is available to help launch ventures inspired by students’ capstone projects. 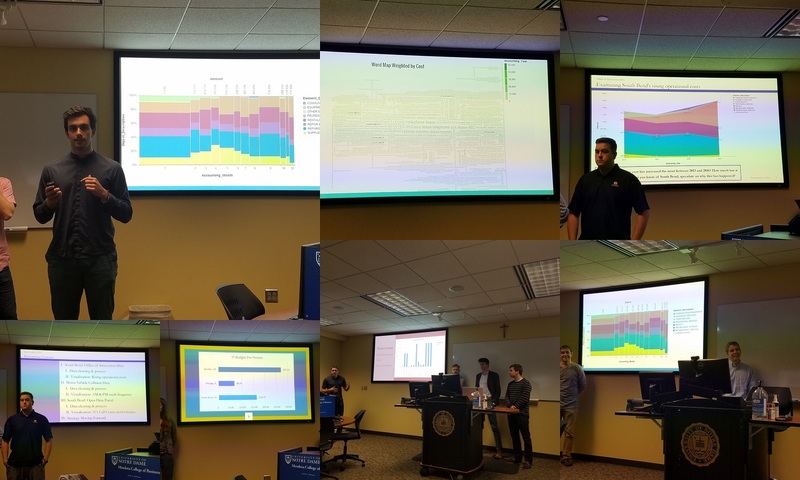 The students had a variety of interesting insights about the city data sets and used SAP Predictive Analytics visualizations to share their findings.